Enter your registered Mobile number or Email address and we'll send you an OTP to set up a new password. Enter a valid Mobile number to register with us. Enter One Time Password (OTP) sent to your Mobile number and set a password. Login with your mobile number and password and you are sorted. Already Registered? Use your existing login details to verify your mobile number. Enter a valid Mobile number for verification. Enter One Time Password (OTP) sent to your Mobile number and you account will be verified. Please enter a valid Mobile number or Email address registered with us. A One Time Password (OTP) will be sent to your Mobile number or Email address. Enter the One Time Password (OTP) and set a new password. Each individual carries a style of their own. The unique style of an individual is depicted in how they wear clothes, their hairstyles, their accessories are more. Both men and women nowadays are very fashion conscious and love to look perfect and for that they devote in a good amount of time, one of the final pieces that complete the entire look or a man or a woman is a stylish pair of sunglasses. They not only define a fashion statement but are a great shield for your eyes against the harsh rays of the sun. The appreciable part about sunglasses is that they can be carried by people of any age group, young or old. They come under various brands, high end or affordable and possess various styles and designs catering to different face cuts and complexions. 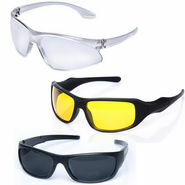 The market is filled with range of sunglasses and people love to have at least one in their wardrobe. Chic Sunglasses for All tastes! Depending upon the various tastes and likings of different individuals, sunglasses come under endless shapes, styles, color patterns and framing fulfilling the fashion needs of people. With different materials used are of god quality with exotic designs and colorful bright patterns. Naaptol.com offers you an exclusive range of designer sunglasses from number of popular brands like Dolce and Gabbana, Burberry, Fastrack, DKNY, Guess, GUCCI and much more. You can also find affordable ranged sunglasses under brands like Yepme, Vintage, Olvin and more. Copyright © 2019 naaptol.com. All rights reserved.